A couple of weeks ago I went to Boulogne sur Mer and visited the marvellous Côte d’Opale. I had two great summer days between Boulogne and Calais and strongly recommend this little trip if you are looking for enchanting places. A thing that struck me there is the quantity of wind there is almost all the time. If the Côte d’Azur could and should benefit from solar energies (photovoltaic, thermal, concentrated), the Côte d’Opale should tap into its huge wind energy potential. 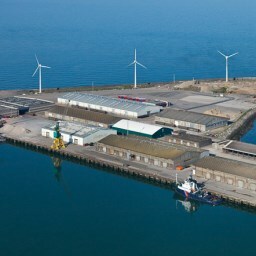 There are to date only four wind turbines in the harbour of Boulogne sur Mer (see photo). No doubt there could be many more. As Enerzine [Fr] reported in 2009, 20 to 30 wind turbines could be installed there, each of them having a capacity of three to five megawatts. the costs would have to be kept low to spur further investments. France had – and perhaps still has – a plan to start offshore wind energy production. Given how our neighbors from across the English Channel are ramping up their production, there is no doubt France could do a lot with this renewable energy source. Other renewable energy sources that could be combined with offshore wind are marine energies – both tidal and wave. the wind energy potential of the North Sea is superior to the total energy provided by the Persian gulf and would enable Northern Europe to become energy independent. Now let’s hope something in that magnitude will happen in the next decade or so.